There are two general types of cyclones: (1) high efficiency, and (2) low pressure. 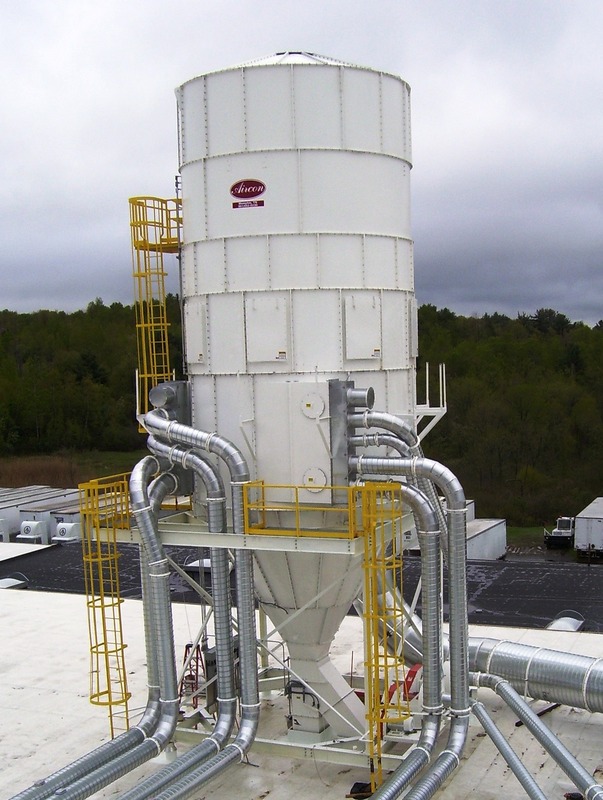 High efficiency cyclones are tall, narrow units with a small diameter to elevation ratio. They are generall used in the woodworking and grain industry, especially in feed mills on pellet coolers. Low pressure cyclones have a much larger diameter-to-diameter ratio, and they are most often used in paper trim collection systems where high-efficiency is not an overriding concern. While a pressure loss across a low pressure cyclone averages 1.5 inch water column, a high-efficiency cyclone may lose as much as 5 inch water column. Two HE Type Cyclones used in a pellet cooler application. Three AC Cyclones used in a paper trim collection system with three grade separation.